I recently heard about a free bar code scanner available at Radio Shack (tm). Not one to pass up free hardware, I went and grabbed one to play with. Not one to jump right in, I checked around on the Internet to see what could be done with my free barcode scanner - and lo and behold, it turns out that not only was there a linux driver, but that the author had been sent a cease and desist order! Now, not one to give up, I kept doing research on the subject until I found a curious note from a guy named Jeff Dobkin. It seems he poked around on his scanner, with board revision FM+H Ver 0.3 and found that adding a jumper caused it to output plain ASCII - and just the data, not the serial number or type. Wow! I thought, but I have a newer rev board - the TM+H Rev 3. Would it work? Only one way to find out - fire up the old soldering iron. Anyway - here are some illustrations showing how to perform the modification on your scanner. Shown below are some pictures of my scanners board, with colored dots noting areas of interest. 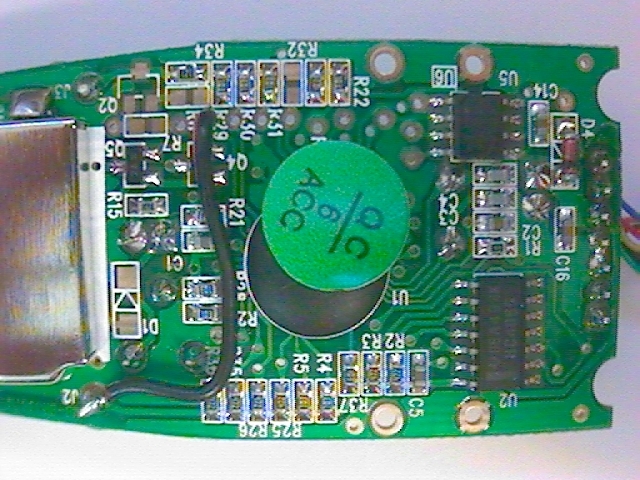 This second image shows the backside of the board with the jumper wire. The yellow dot covers the pad that you should jumper to. 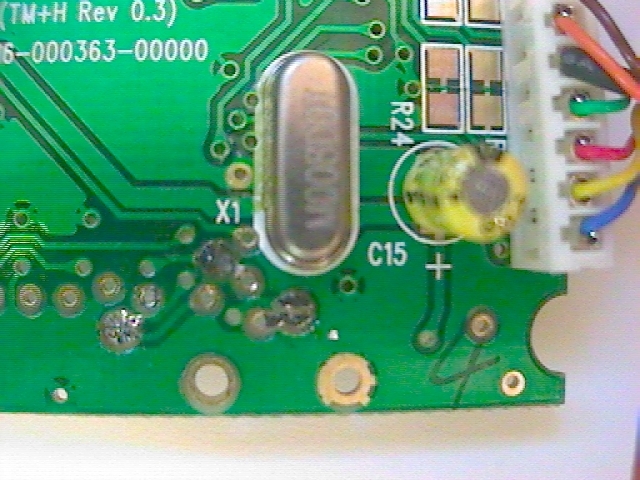 You need to apply +5 volts to this pad, so jumper a wire from the RED LED power wire (Vled+) to this pad. Jumpering to other pads doesn't seem to have any effect on the scanner, but also doesn't harm the scanner either. As a side note, I suggest you "tin" the wire before inserting it into the plated hole. Tinning just means heating the wire and letting it soak up a little solder until it looks like a solid wire. Don't use too much solder, though, or it won't fit in the hole. Lastly, it is possible to disable the serial number embedded in each scanner as well. If you will notice the red shaded pads near X1 - you will discover that they connect a certain serial EEPROM chip, a S93C46DV03. By removing the shorting "blobs", you will disconnect the serial EEPROM from the microcontroller, effectively declawing the board. Note, if you apply the above hack, there isn't any point in applying this one, as the serial number data isn't sent. If, however, you want to "anonymize" your cat, then by all means - desolder those connections! As a side note, I have read that you can still use a reader with the serial EEPROM disabled with the original software. By only applying this second modification, you get a reader with no serial number at all. Note, none of the info on this page was original thought. The text clipping I made indicates a certain Jeff Dobkin found out about this first. I found the reference at http://www.topica.com/lists/pla_upl/read/message.html?mid=1702776249 I would like to note Michael Guslick's excellent hardware discussion at http://air-soldier.com/~cuecat/. From this site, I understood the importance of the serial EEPROM chip. Desoldering these pads was merely an extension of this. :) Obviously, I don't need the driver software anymore, but I did go to the trouble of understanding how the encoding scheme works - and it is terribly simple. (laughable, if this was the basis for any kind of legal protection). There is a great site http://www.fluent-access.com/wtpapers/cuecat/ kept by Stephen Satchell regarding the encoding scheme. So, now where? Well, you have a fully generally purpose barcode reader - you do the math. Personally, I'm whipping up an Access database based on both the modified, and unmodified readers. The unmodified reader can be used to provide accountability - see who changed that data by storing the serial number along with the data! Apparently, the decryption on/off switch is different for different boards. The FM+H Ver 0.3 and TM+H Ver 0.3 both appear to use the second pad from the left. 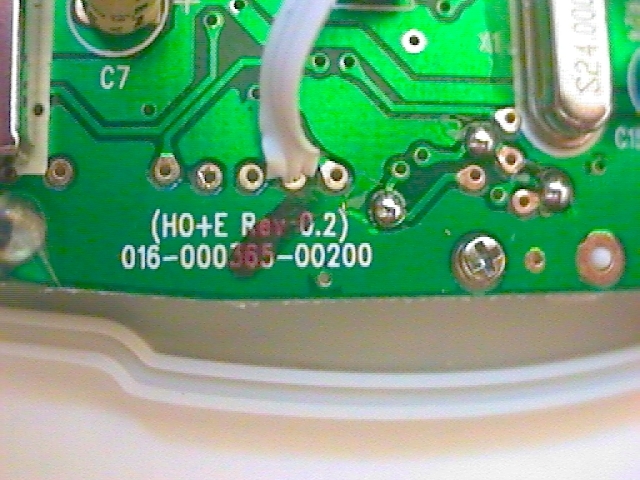 The HO+E Ver 0.2 board uses the *FOURTH* pad from the left. 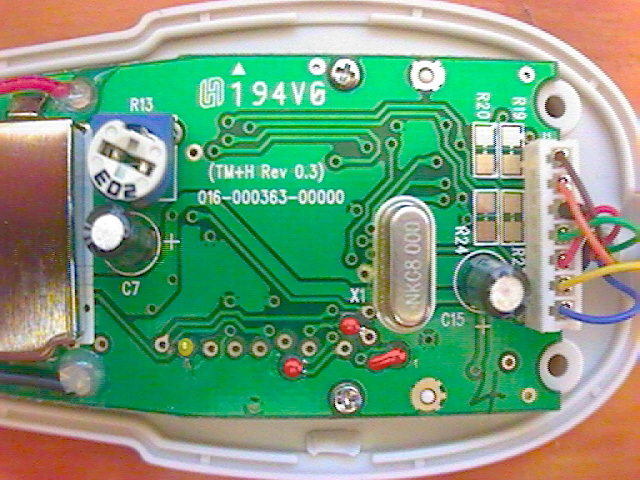 This corresponds to a scanner model 05A00 - the 07A00 all appear to use the TM+H Ver 0.3 boards. In the meantime, the wand works just fine in this mode for every other kind of barcode type the reader is capable of reading. If you have a board not mentioned in the table above, please give the hack a try, and indicate if it worked or not. It would be nice to see how many board revisions are out "in the wild". (C) Seth Henry 2000 All rights reserved.